GALA Yuzawa is in the town of Echigo Yuzawa in Niigata Prefecture. 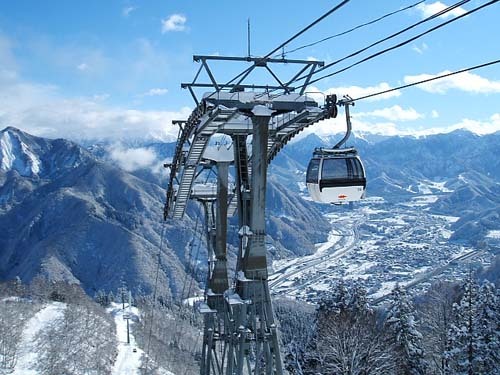 Located about 200kms to the north of Tokyo, the area is famous for its impressive snowfall, and with skiing from 1,181m down to 358m, GALA Yuzawa resort is the perfect place to enjoy the excellent snow conditions. Just 75 minutes from Tokyo Station.GALA Yuzawa is directly connected to the bullet train station. As you get off the train, pick up your lift ticket and gear, and you’re on your way! It couldn't be easier. You can wake up in Tokyo and be on the slopes by 8 am! The suggested season is winter. A free shuttle bus service from major hotels, the station, and other places to the ski resort is available throughout the day, starting early morning. For example, the shuttle bus stop for the Inamoto Inn is located to the right of the west exit of Echigo-yuzawa Station. Quay of columnar joints and torrent of Kiyotsu river.